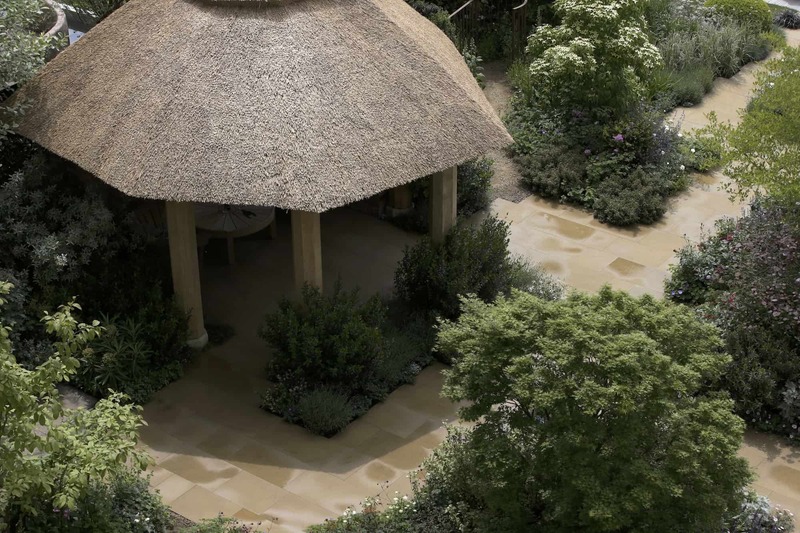 The M&G Centenary Garden’ titled ‘Windows through Time’, designed by Roger Platts has been awarded a Gold Medal at the Chelsea Flower Show 2013. Roger Platts “Here we are in the garden, finally completed. We are in the shady area here, so there’s the Aucuba japonica which I’d always anticipated would be at the back representing one of the sort of Victorian/Edwardian plants. Moving on, to the seating area. The rhododendron, here has just flowered on cue! Underneath we have the snowball tree, or the Viburnum opulus sterile and the lovely Japanese Acer, which just frames the end of the seat. The old sandstone wall has really gone in well; in fact I’ve been asked if it was there when we arrived! I’m very pleased the way the mullion windows have fitted within it. The first bit of planting we did when we arrived was the ivy because it takes quite sometime for the ivy to move around and look natural. Below the wall is the gulley, with the drain very subtly taking away any bits that drop down from the plane trees above. It’s drifting into the drain into a tank underneath and then reappearing through the rusty pipe. The summerhouse is all about being and feeling connected with the garden. So I’m really glad that the paving actually flows in there and that when you’re inside the summerhouse you feel like part of the garden. The fact that it’s got such heavy timbers, gives that lovely solid English oak to it. The heavy oak windows have really worked out ever so well; I hadn’t expected how well the view would be though the back. So, the kissing gate works as a link really, to an imaginary orchard we have the apple tree just the other side of the hedge. The pathway leading to it, we’ve used this derivative of sandstone which is a mixture of sand and different size stones. And that just leads you down there with the odd little spot plant, this yellow geum here, ending with a full stop of foxgloves right on the corner. I’m delighted the way the corten steel sculpture connects with the theme of ‘Windows through time’ and the Chelsea Centenary. It leads your eye to all different aspects and as you walk along the front of the garden it frames the different aspects; the kissing gate, the summerhouse and the individual plants, which I had hoped all along”. Play the video below to take a tour of his garden.